We are a 501(c)3 not-for-profit organization, so your donations are tax-deductible – and, of course, deeply appreciated. We are currently raising money toward our general operating costs. Ticket sales account for less roughly 50% of our operating budget. We rely heavily upon the support of our community through volunteer time, donations and fundraising drives, and we appreciate your generosity. The cost of producing theatre in the Bay Area is substantial. Helps us continue to produce award-winning, high-quality theatre for another 89 years! Get tickets to six full-length, high-quality productions and one Ross Alternative Works (RAW) production for only $145! That’s a savings of $37 off the price of individual, general admission tickets. As a subscriber, you can use your six season tickets at any performance of the season. Go online or call our box office to reserve. Miss a show? Use your extra ticket to invite a friend to any show of the regular, main stage season. Get priority, first choice seating, and free cookie coupons. Season subscribers are also invited to our special opening night wine and hors d’oeuvres press receptions from 6:30 to 7:30 pm during opening night for every production! And don’t forget Sunday matinées the first weekend of every run! Click (HERE) to order online through Brown Paper Tickets. Please note, your tickets will be sent by Ross Valley Players; disregard any ticket stubs sent by Brown Paper Tickets, as you will be receiving your subscription package by mail from RVP. Call (415) 456-9555 ext. 3 and leave a message with your name and phone number. Someone will return the call to place your order for an 89th Season Subscription. Tickets will be mailed within six weeks. A ship is wrecked on the rocks. Viola is washed ashore but her twin brother Sebastian is lost. Determined to survive on her own, she steps out to explore a new land. So begins a whirlwind of mistaken identity and unrequited love. The nearby households of Olivia and Orsino are overrun with passion. Even Olivia’s upright housekeeper Malvolia is swept up in the madness. Where music is the food of love, and nobody is quite what they seem, anything proves possible. 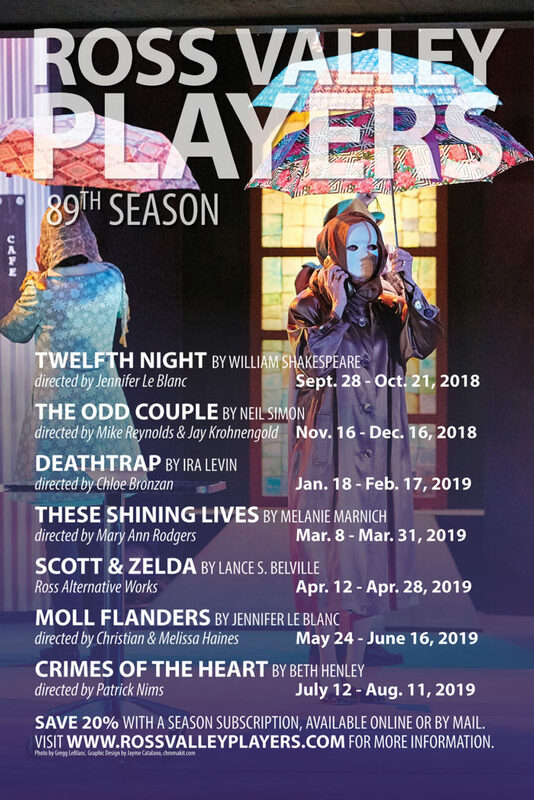 After 89 years, Ross Valley Players is presenting a work of William Shakespeare for the first time on the Barn Theater stage. Come see this imaginative interpretation of one of the Bard’s most beloved works, as envisioned by director Jennifer Le Blanc. When once-successful Broadway playwright Sidney Bruhl sees his latest Broadway effort bomb on its opening night, he tumbles into despair – until he receives a package from his former student Clifford Anderson. Inside is an unproduced script that’s better than anything Sidney has written in years. At the urging of his wife, Myra, Sidney undertakes a plan to lure Clifford to his country home, murder him and then announce the script as his own work. One of the great popular successes in Broadway history, this ingeniously constructed play offers a rare and skillful blending of two priceless theatrical ingredients: gasp-inducing thrills and spontaneous laughter. Directed by Chloe Bronzan. Based on true events, this powerful play chronicles the strength and determination of women considered expendable in their day. Catherine and her friends are dying, it’s true; but theirs is a story of survival in its most transcendent sense, as they refuse to allow the company that stole their health to kill their spirits—or endanger the lives of those who come after them. Set during a period when women increasingly entered the work force, its impact is still resonant today. Directed by Mary Ann Rodgers. ROSS ALTERNATIVE WORKS presents the fully-staged production of Scott and Zelda, the Beautiful Fools by Lance S. Belville. The darlings of the Jazz Age dance across an international landscape from the hot spots of Europe to the deadly glitter of Hollywood. They were Zelda, the Southern Belle and Scott, the young author who gave the era its name. Along the way, there would be agents, lovers, Ernest Hemingway and a sweet daughter named Scottie. Some lights never go out. Join us for three staged readings in addition to Ross Alternative Works’ fully staged production of Scott and Zelda, the Beautiful Fools. Suggested donation of $10 at the door. See our website for more details about our mission and how you can get involved! Swiss Family Robinson: A Musical Adventure by John Kennedy This classic adventure comes to life in a magical new tale, a musical reading presented in cooperation with the Mountain Play. available! Directed by Christian and Melissa Haines. The three Magrath sisters gather in Hazlehurst, Mississippi, to await news of their grandfather’s death. Lenny, the oldest sister, is unmarried at thirty and facing diminishing marital prospects; Meg, the middle sister, who quickly outgrew Hazlehurst, is back after a failed singing career on the West Coast; while Babe, the youngest, is out on bail after having shot her husband in the stomach. The play is the story of how its young characters escape the past to seize the future—but the telling is so true and touching and consistently hilarious that it will linger in the mind long after the curtain has descended. Winner of the 1981 Pulitzer Prize and the New York Drama Critics Circle Award. Directed by Patrick Nims.